Proposed by the president of Costa Rica in November of 1981, the International Day of Peace was unanimously passed by the United Nations General Assembly. The International Day of Peace is a day dedicated to the cessation of all hostilities around the world and for people to engage in activities that promote global peace. Originally, the International Peace Day was set to coincide with the opening of the UN General Assembly on the third Thursday of September. The first observance was in September, 1982. However, in 2004, the General Assembly again voted unanimously to set the permanent date for September 21st. It is on this day that the global population is asked to commit to a peace world and participate in activities devoted to that goal. The International Day of Peace is marked at noon. The Secretary General of the United Nations rings the Peace Bell with members of the General Council in attendance. The bell is made from the coins donated from children around the world and is a gift from the United Nations Association of Japan in remembrance of the horrible toll of war. It is inscribed with the words, “Long live absolute world peace”. A moment of silence begins at noon and signals the hope for world peace. The symbol adopted for International Peace Day is a dove with an olive branch in its mouth and an overlay of the continents. Millions of people around the world participate in celebrations of Peace Day by helping others, holding prayer vigils, parades and many other activities. School children may make and display windmills with peace messages, displaying their school’s Peace Pole and reciting poetry or stories of peace. Community members may engage in interfaith or cross cultural discussions or peace education. Others may meditate on peace. There is no one way to celebrate International Peace Day as long as it furthers the goals of world peace. 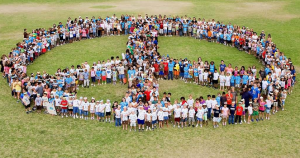 Each International Peace Day has a theme to frame activities. The theme for 2016 is “The Sustainable Development Goals: Building Blocks for Peace”. Member states of the United Nations have agreed to seventeen ambitious goals to be accomplished by 2030. The goals include eliminating global poverty, sharing dwindling resources, world hunger, environmental issues and others critical to ensure all people have the means to live without want and conflict. Eliminating poverty and strengthening educational opportunities is seen as the most crucial elements to reduce conflict. International Peace Day has prompted millions over the years to reflect on the meaning of peace and how conflict affects the world’s people. It is a day to look beyond borders, religion, and race to connect with each other for a common goal.